Exactly how many people is Arisse related to? I know that Kevan and Corisande are her children, making Briony her granddaughter, and you have to marry her son Thaddeus if you've messed up with the nobility, and Kiran becomes an option if you kill Arisse. Fabian mentions Arisse's daughter Adele, whom Adair is close to. From lessons and events in the game, we learn about the former Duke of Mead, Corisande's older half-brother, but he's not Arisse's actual kid, because they're both Nalin's children. 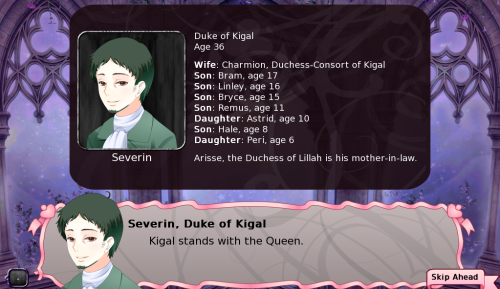 Arisse is also the Duke of Kigal's mother-in-law, and he brought three sons to the ball, so that's four grandkids. Since Fabian mentions Arisse's "brood," she probably has more relatives that I'm forgetting. Let's see...if I recall correctly, Arisse has six biological children of her own: Corisande, Kevan, Charmion, Kiran, Thaddeus, and Adele. She has two named stepchildren: Hyacinth and Adair. Fabian mentions having older children, but I don't think we have any more details. Corisande is married to Ignatius, and they have two children: Briony and Noll. Charmion is married to Severin and they have seven children, including Linley. Here's Severin's dossier from his only line in the game. So six children, nine grandchildren, and at least two stepchildren... Seventeen named characters in total. If you include her sons-in-law, that's nineteen named characters she's related to. If you include the three husbands (Nalin, Jael, and Fabian), that's twenty-two. Edit: Oh right, Hyacinth was briefly married to Paulus, the Duke of Ursul. Forgot all about that. Last edited by Mir on Sun May 10, 2015 4:36 pm, edited 1 time in total. Mir wrote: Let's see...if I recall correctly, Arisse has six biological children of her own: Corisande, Kevan, Charmion, Kiran, Thaddeus, and Adele. ...Wow. That is an impressive list of relatives. Thank you!